Deterioration of the strength of the present fabric covering is the most common reason to re-cover an aircraft. The strength of fabric coverings must be determined at every 100-hour and annual inspection. Minimum fabric breaking strength is used to determine if an aircraft requires re-covering. Fabric strength is a major factor in the airworthiness of an aircraft. Fabric is considered to be airworthy until it deteriorates to a breaking strength less than 70 percent of the strength of the new fabric required for the aircraft. For example, if an aircraft was certificated with Grade-A cotton fabric that has a new breaking strength of 80 pounds, it becomes unairworthy when the fabric strength falls to 56 pounds, which is 70 percent of 80 pounds. If polyester fabric, which has a higher new breaking strength, is used to re-cover this same aircraft, it would also need to exceed 56 pounds breaking strength to remain airworthy. In general, an aircraft is certified with a certain fabric based on its wing loading and its never exceed speed (VNE). The higher the wing loading and VNE, the stronger the fabric must be. On aircraft with wing loading of 9 pounds per square foot and over, or a VNE of 160 miles per hour (mph) or higher, fabric equaling or exceeding the strength of Grade A cotton is required. This means the new fabric breaking strength must be at least 80 pounds and the minimum fabric breaking strength at which the aircraft becomes unairworthy is 56 pounds. On aircraft with wing loading of 9 pounds per square foot or less, or a VNE of 160 mph or less, fabric equaling or exceeding the strength of intermediate grade cotton is required. This means the new fabric breaking strength must be at least 65 pounds and the minimum fabric breaking strength at which the aircraft becomes unairworthy is 46 pounds. Lighter weight fabric may be found to have been certified on gliders or sailplanes and may be used on many uncertificated aircraft or aircraft in the Light Sport Aircraft (LSA) category. For aircraft with wing loading less than 8 pounds per square foot or less, or VNE of 135 mph or less, the fabric is considered unairworthy when the breaking strength has deteriorated to below 35 pounds (new minimum strength of 50 pounds). Figure 1 summarizes these parameters. Manufacturer’s instructions should always be consulted first for fabric strength inspection methodology. These instructions are approved data and may not require removal of a test strip to determine airworthiness of the fabric. In some cases, the manufacturer’s information does not include any fabric inspection methods. It may refer the IA to AC 43.13-1, Chapter 2, Fabric Covering, which contains the approved FAA test strip method for breaking strength. The test strip method for the breaking strength of aircraft covering fabrics uses standards published by the American Society for Testing and Materials (ASTM) for the testing of various materials. Breaking strength is determined by cutting a 1¼ inch by 4–6 inch strip of fabric from the aircraft covering. This sample should be taken from an area that is exposed to the elements—usually an upper surface. It is also wise to take the sample from an area that has a dark colored finish since this has absorbed more of the sun’s UV rays and degraded faster. All coatings are then removed and the edges raveled to leave a 1-inch width. One end of the strip is clamped into a secured clamp and the other end is clamped such that a suitable container may be suspended from it. Weight is added to the container until the fabric breaks. The breaking strength of the fabric is equal to the weight of the lower clamp, the container, and the weight added to it. If the breaking strength is still in question, a sample should be sent to a qualified testing laboratory and breaking strength tests made in accordance with ASTM publication D5035. Note that the fabric test strip must have all coatings removed from it for the test. Soaking and cleaning the test strip in methyl ethyl ketone (MEK) usually removes all the coatings. Properly installed and maintained polyester fabric should give years of service before appreciable fabric strength degradation occurs. Aircraft owners often prefer not to have test strips cut out of the fabric, especially when the aircraft or the fabric covering is relatively new, because removal of a test strip damages the integrity of an airworthy component if the fabric passes. The test strip area then must be repaired, costing time and money. To avoid cutting a strip out of airworthy fabric, the IA makes a decision based on knowledge, experience, and available nondestructive techniques as to whether removal of a test strip is warranted to ensure that the aircraft can be returned to service. An aircraft made airworthy under an STC is subject to the instructions for continued airworthiness in that STC. Most STCs refer to AC 43.13-1 for inspection methodology. Poly-Fiber™ and Ceconite™ re-covering process STCs contain their own instructions and techniques for determining fabric strength and airworthiness. Therefore, an aircraft covered under those STCs may be inspected in accordance with this information. In most cases, the aircraft can be approved for return to service without cutting a strip from the fabric covering. 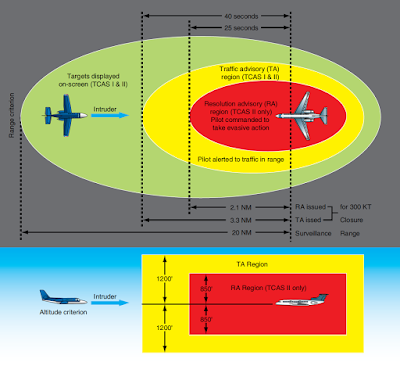 The procedures in the Poly-Fiber™ and Ceconite™ STCs outlined in the following paragraphs are useful when inspecting any fabric covered aircraft as they add to the information gathered by the IA to determine the condition of the fabric. However, following these procedures alone on aircraft not recovered under these STCs does not make the aircraft airworthy. The IA must add his or her own knowledge, experience, and judgment to make a final determination of the strength of the fabric and whether it is airworthy. Exposure to UV radiation appreciably reduces the strength of polyester fabric and forms the basis of the Poly-Fiber™ and Ceconite™ fabric evaluation process. All approved covering systems utilize fill coats applied to the fabric to protect it from UV. If installed according to the STC, these coatings should be sufficient to protect the fabric from the sun and should last indefinitely. Therefore, most of the evaluation of the strength of the fabric is actually an evaluation of the condition of its protective coating(s). Upon a close visual inspection, the fabric coating(s) should be consistent, contain no cracks, and be flexible, not brittle. Pushing hard against the fabric with a knuckle should not damage the coating(s). It is recommended the inspector check in several areas, especially those most exposed to the sun. Coatings that pass this test can move to a simple test that determines whether or not UV light is passing through the coatings. This test is based on the assumption that if visible light passes through the fabric coatings, then UV light can also. To verify whether or not visible light passes through the fabric coating, remove an inspection panel from the wing, fuselage, or empennage. Have someone hold an illuminated 60-watt lamp one foot away from the exterior of the fabric. No light should be visible through the fabric. If no light is visible, the fabric has not been weakened by UV rays and can be assumed to be airworthy. There is no need to perform the fabric strip strength test. If light is visible through the coatings, further investigation is required. Mechanical devices used to test fabric by pressing against or piercing the finished fabric are not FAA approved and are used at the discretion of the FAA-certificated mechanic to form an opinion on the general fabric condition. Punch test accuracy depends on the individual device calibration, total coating thickness, brittleness, and types of coatings and fabric. If the fabric tests in the lower breaking strength range with the mechanical punch tester or if the overall fabric cover conditions are poor, then more accurate field tests may be made. The test should be performed on exposed fabric where there is a crack or chip in the coatings. If there is no crack or chip, coatings should be removed to expose the fabric wherever the test is to be done. 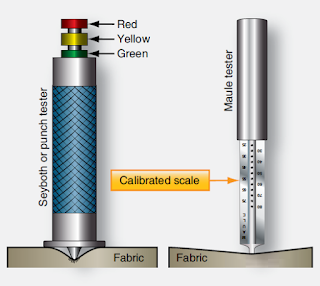 The Maule punch tester, a spring-loaded device with its scale calibrated in breaking strength, tests fabric strength by pressing against it while the fabric is still on the aircraft. It roughly equates strength in pounds per square inch (psi) of resistance to breaking strength. The tester is pushed squarely against the fabric until the scale reads the amount of maximum allowable degradation. If the tester does not puncture the fabric, it may be considered airworthy. Punctures near the breaking strength should be followed with further testing, specifically the strip breaking strength test described above. Usually, a puncture indicates the fabric is in need of replacement. A second type of punch tester, the Seyboth, is not as popular as the Maule because it punctures a small hole in the fabric when the mechanic pushes the shoulder of the testing unit against the fabric. 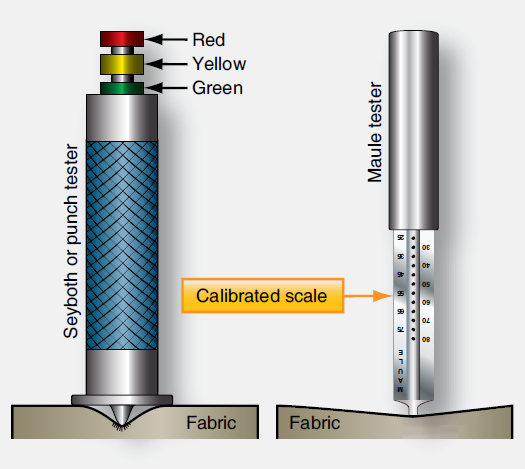 A pin with a color-coded calibrated scale protrudes from the top of the tester and the mechanic reads this scale to determine fabric strength. Since this device requires a repair regardless of the strength of the fabric indicated, it is not widely used.